DZ situated in the north of South Island with awesome weather pattern, breathtaking views; snow capped mountains, golden beaches, turquoise oceans...Paradise! All sports jumpers and students are warmly welcomed. 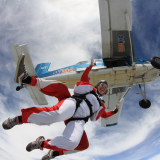 Home of Good Vibes, NZ's largest annual skydiving boogie!